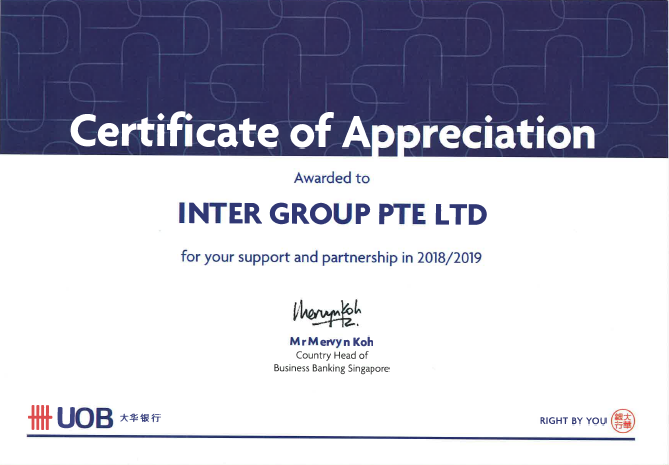 SINGAPORE, 28 March 2019 – Inter Group would like to thank UOB Bank for the Certificate of Appreciation 2018/2019. We would also like to extend our gratitude to our valuable clients who have helped us to achieve such recognition from one the renowned banks in Singapore and Asia. This recognition is a testament of our commitment to provide our valuable clients with greater access to financial services. Our clients will be glad to know that they have the benefit of enjoying timely and reliable services not just from us but also from UOB Bank given our longstanding relationship. To quote Helen Keller; ‘Alone we can do so little; together we can so much’, reflects our partnership with UOB Bank. We both share the same interest to provide our clients greater access and growth for their companies in Singapore and within the region. Our client’s success is our success. We would like to take this opportunity once again to thank all our clients for believing and trusting us to be your corporate services provider. UOB Bank provides a wide range of financial services such as: personal financial services, private banking, commercial and corporate banking, investment banking, corporate finance, capital market activities, treasury services, futures broking, asset management, venture capital management, insurance and stockbroking services.